If you’re looking for something a bit different in the Hatchback class to the usual suspects, unearthing the new Suzuki Baleno Hatchback could be the best thing you’ve done in your search so far. Something of a hidden prize, it looks slightly dull on the outside but has a lot to offer on the inside. It’s entertaining to drive, comfortable, practical and affordable. 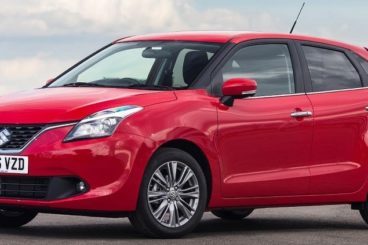 And although you might be wondering why Suzuki have seen reason to roll out a new Hatchback since they’ve already got many bases covered with the popular Swift, the Baleno is a bit cheaper, more useful and represents an interesting alternative. It’s a bit of a catch. OSV takes a closer look with our Suzuki Baleno Hatchback review. Stick to low speeds and this car should stay quiet. Once you arrive on the motorway, however, things get decidedly noisier. The more you rev, the less refined it becomes. Once you get up to speed, exterior noises – wind and road noises – will probably drown your engine out. Whether you think this is a good thing or not is down to personal discretion. The car is light, and as such it feels nippy and agile around town. The steering is a bit too vague for our liking, but the body lean is nicely controlled, while grip is in abundance. The ride itself isn’t brilliant. Career over a speed bump even at a moderate pace and you’ll really feel it. There is a lot of noticeable bounce, and the car isn’t the most comfortable in its class. It’s willing, though, and tackles bends with plenty of vim and vigour. In terms of engines, the turbocharged three-pot 1.0-litre 109bhp petrol unit is a good choice. I revs freely, has a lot of punch, and can be paired up with either a 5-speed manual ‘box or a 6-speed automatic. The latter offers sharp and precise stick action. It’s a sprightly little engine too, and can get from rest to 62mph in a matter of 11.4 seconds before maxing out at 124mph. There is a 1.2-litre hybrid unit available too. It takes a longer 12.3 seconds to cover the 0-62mph sprint and maxes out at 111mph. It’s quiet and smooth at low speeds but loses its refinement as you quicken the pace. And because it doesn’t come with a turbocharger, you’ll find yourself really working it. 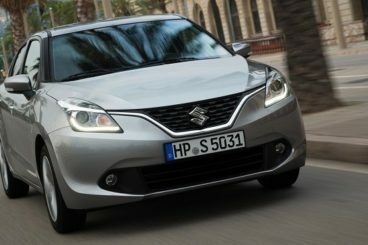 The Suzuki Baleno Hatchback is nicely equipped, but although satellite navigation comes as standard, it’s a little hard to use. With that said, the car is good ergonomically, and all the controls are exactly where you’d want them to be. The quality of the materials used, however, are poor and do let this car down. The design is uninspired and unexciting, with too much drab greys and cheap plastics used. It’s hard to get the impression that the Baleno Hatch is a car that is going to keep giving. Instead, it feels flimsy, and the materials are easily scratched. Although this Hatchback doesn’t weigh much, it’s not a mini-me. It measures 3.9m in length and 1.7m width, and comes with a very impressive 320-litre boot. The cabin is roomy, and leg and head room in the back is good enough to accommodate two adults easily. Taller passengers might feel the pinch, though. 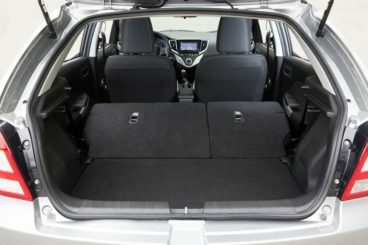 The rear seats fold easily to create extra boot space, and there is an under-floor section for even more of your luggage. The only caveat is a large boot lip. Trim levels have not yet been confirmed, but OSV expects there to be at least two models available. All cars will get a DAB digital radio, sat-nav, Bluetooth connectivity, alloys and air conditioning as standard. The sat-nav is tricky to get to grips with, but at least Suzuki have added it as standard. Luxuries added for the top trim should include heated seats and air conditioning, while the sparse list of optional extras will include heated seats and air conditioning. Buyers get to choose between 9 body colours and a pair of special metallic finishes. Prices for this Hatchback start out from around £13,000 and rise to just over £15,000. If you’re thinking of leasing it over three years on a contract hire, you’d be looking at paying somewhere in the region of £200 + VAT, but prices will vary depending on trim and mileage. It’s fairly cheap to run, with the brand new turbocharged 1.0-litre three-pot petrol engine capable of returning 62.7mpg. Suzuki have christened this unit a “BoosterJet”, and it will cost you £20 per year to tax. The engine line-up lacks a diesel, but the 1.2-litre four-pot petrol “mild hybrid” can develop 88bhp and returns an impressive 70.6mpg. It’s free to tax, and should prove to be a hit with buyers. A standard three year/60,000 mile warranty is offered. It’s not as lucrative as the ones offered by rivals such as Toyota and Kia, who offer up to six years. Suzuki has developed a reputation for producing reliable cars, so maintaining this one shouldn’t cost you too much money or hassle. The car, however, has only been granted two ratings by Euro NCAP for safety. The new Radar Brake Support system is absent from the entry-level model, which is a disappointment. Practicality and room is this car’s trump card. The boot is bigger than the one in the Ford Focus, and can even rival the VW Golf. It isn’t awash with the kind of intelligent touches which you’ll find in its rivals, but the 355-litre boot is one of the biggest in this sector while head and legroom are good up front and in the back. The useful Radar Brake Support system, which detects oncoming vehicles ahead of you, is missing from the entry-level trim, but apart from that standard equipment is very good across all versions. 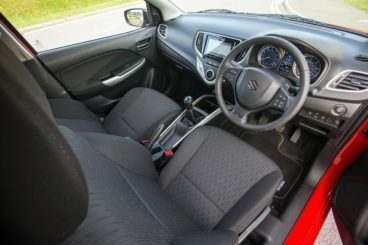 Standard equipment includes alloys, cloth seat trim, electric front windows, front fog lights, heated mirrors, parking sensors, remote locking, sat-nav and traction control. You can usually rely on Suzuki to deliver the goods regarding drivability, and they haven’t disappointed here. Although the Baleno is more comfortable than sporty, it handles well and is sportier than the Swift. For as much entertainment on the road as possible, we recommend pairing up with the automatic transmission with the BoosterJet engine. It’s a buzzy unit and fun to drive. There is lean in bends, but not enough for it to signal the end of the world. It seems a shame that Suzuki have got so many things right inside this car that they’ve neglected the exterior. Looks sell, and the styling here is a letdown. If you judge a book by its cover, the dull exterior doesn’t do this car any justice whatsoever. This means it’s going to be difficult for the Baleno to attract style-conscious buyers who will probably cast their eyes admiringly over the Fiestas and Ibizas of this world. With so many environmentally-aware consumers opting for diesel engines in 2016, it seems strange that Suzuki has decided to omit one from their range. 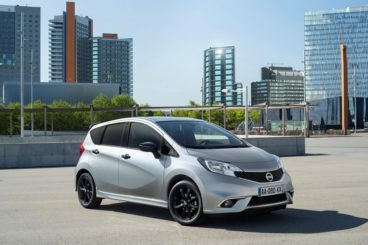 The Nissan Note is already ten-years-old but continues to be popular in the UK with buyers who want something small but spacious, affordable but stylish and efficient but good to drive. It’s really cheap to run, with even its costliest engine capable of returning 55mpg. The most frugal engine in the range is a 1.5-litre diesel engine that is good for 80.7mpg and is free to tax. This makes it a more attractive proposition than the Suzuki Baleno hatch if you’re basing your decision on how affordable a car is going to be. Unlike the Suzuki, the Nissan has got a diesel in its arsenal. There is only one, a 1.5-litre dCi powerplant that develops 89bhp, but it’s sprightly and mighty and can get you from rest to 62mph in 11.9 seconds which is par for the course in this class. The Baleno’s 1.0-litre three-cylinder petrol engine is marginally quicker, and is quieter, too. Where the Nissan Note comes out on top is its design. It’s got a slinky look to it that is enhanced by a raised roofline, and it looks like a genuinely cute, twinkle-toed city car that you’d enjoy driving around town. It’s cheerfully compact look disguises the fact that the Note is really spacious indoors. Indeed, both of these hatchback’s are really practical, and can easily rival the Fiesta the VW Polo for space. The Nissan Note’s boot measures 380-litres, which makes it bigger than the Baleno’s, while usability throughout the cabin is hard to argue with. The Nissan is better looking than the Baleno indoors, and generous standard equipment includes cruise control, USB ports, and a Bluetooth phone connection. 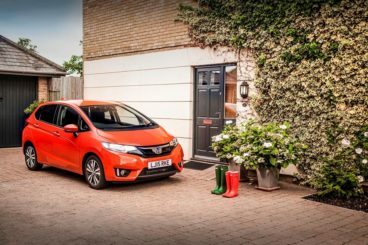 If space and practicality is at the top of your list, the Honda Jazz should be a genuine contender for your cash. Undeniably, the Jazz is the most spacious and practical car in this class. Honda themselves reckon there is as much room in here as there is in the Mercedes S-Class saloon, but while they may be stretching their imagination a little bit there, the Jazz does major in practicality. The boot measures at 354-litres, which makes it bigger than the one in the Suzuki, and it can be increased in size to 1,314-litres if you fold the rear seats. The driving position is high, which makes getting in and out easy, while both the driver’s seat and the steering wheel are adjustable. There are various storage spaces dotted in and around the place, while head and legroom up front and in the back really can rival a luxury saloon. Like the Baleno, the Jazz is not sporty, but it is easy to drive, especially around the town. It’s a good little runabout that lacks a bit of power but makes up for it in willingness. It always feels comfortable, and the ride is now more forgiving than last time around. And like the Baleno, the engine line-up lacks a diesel. In fact, there is only a solitary engine available at present, a 1.3-litre petrol that can be paired up with a 6-speed manual ‘box or a CVT automatic. The engine can develop 101bhp, the acceleration is smooth, and it can return 61.4mpg while costing £20 per year in tax. Not as cheap as the Baleno, and it does get noisier the more you rev it. Thanks to the success of the Suzuki Swift, the Baleno hasn’t been uncovered by as many buyers as a car of this quality should be. Something of a hidden gem in a competitive sector, it’s got all the equipment to be a major success – it just needs to be seen a bit more. It’s actually a more practical alternative to the Swift. It’s also cheaper, boasts excellent running costs, and is jolly good fun to drive. 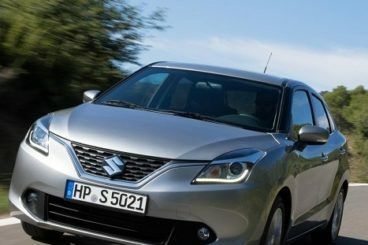 If you and your family want a cheap and cheerful family car with a friendly face, the Suzuki Baleno Hatchback is well worth a test drive.